[Stride]-Stride Step-[Choose one or more cards with the sum of their grades being 3 or greater from your hand, and discard them] Stride this card on your (VC) from face down. [ACT](VC):[Choose a card from your hand, and put it into your soul] This unit gets [Power]+1000 for each card in your soul until end of turn. If the sum of [Power] increased with this effect during this turn is 10000 or more, until end of turn, all of the rear-guards in your front row get [Power]+5000, and this ability cannot be activated. For some reason, I think he likes clearing away pebbles from footpaths and hates the taste of bear. Anyway, Fred here has an ACT skill that's actually NOT a once per turn ability. He absorbs a rear-guard into the soul, then gains 1000 power for every card in the soul. If he gains 10k or more power this way, all your front-row rear-guards gain 5k until end of turn, and then you can't use the skill anymore. First impressions are pretty average. Columns are a good way to go I suppose, Dark Irregulars was good at that from the offset, but I don't fancy the -1 involved, particularly compared to something like Doombrace for Genesis. I am of course assuming you use this in a Schar deck, but to be honest, there are better options. If you're rogue and looking to use this in an Echo of Nemesis deck or something which is less demanding on your soul requirements, sure, go for it. Only use if you're very confident in the card advantage you have compared to your opponent, because DI is pretty RG dependant, frankly. 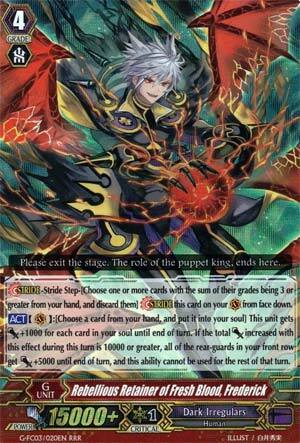 Before I look at the card, I'm going to assume that this is a Dark Irregular unit. Yep! I was right. WHOO! Anyway, what does Frederick give us? Can I call him Freddy? Huh, it's Amon as a Stride, just that you put a card from your hand into your soul, if it has +10000 from that ability, your front row rear guards gets +5000 each and you can't do it again. At first I was like "what is this..." then I saw that it was an activated ability. So, like, oh, you can do it more than once a turn, neat. Anyway, it's basically Amon as a Stride. Which isn't bad, seeing as Amon can swing for stupidly high numbers. Frederick's an okay first stride. I personally wouldn't use more than two cards from hand to sink into the soul for the rearguard buff though. In a Blade Wing deck, you could ignore this guy entirely for Tibold, but Reijy does have things you'd want to shove in the soul from you hand when set 7 drops. Also, Amon has his own rearguard buffer, but he does cost a counterblast. Frederick can be outclassed in many situations, but if it's your first stride, you're at 8-9 soul, and want to move a card from your hand to your soul to set up a future play, give him a shot. He'll pump Doreen, so there's that.